Navy quarterback Garret Lewis, left, gains yardage on a keeper in the second quarter against Temple on Saturday. ANNAPOLIS, Md. — Playing without injured running back Ryquell Armstead, Temple still continued its recent success against Navy. 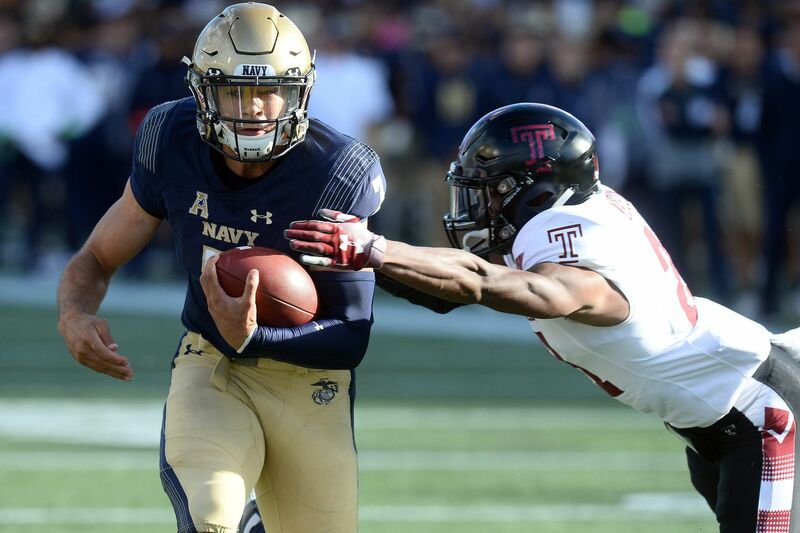 Ventell Bryant's first touchdown since 2016 broke a 17-17 tie and propelled Temple to a 24-17 win over Navy on Saturday at Navy-Marine Corps Memorial Stadium. Last year, Temple (4-3, 3-0 American Athletic Conference) turned its season around with a 34-26 win over Navy (2-4, 1-2). In 2016, the Owls won the AAC championship game, 34-10, at Navy. On his touchdown, Bryant said that one of the corners tried to cheat on another Temple receiver, which opened things up for him. "I was wide open, just caught the ball and ran into the end zone," said Bryant, who had eight receptions for 147 yards and the score. Russo, who completed 23 of 31 for 300 yards, one touchdown and one interception, said Temple thought it could hit on a vertical play based on the coverage. "I saw the corner kind of coming off, trying to play the seam and the outside," Russo said. "We thought Ventell could run right past them. I had great protection and all I had to do was put it out there and let Ventell do the rest." It was Bryant's first touchdown since the 2016 AAC championship game win at Navy. "The last time I was in the end zone was here," he said alluding to Navy's stadium. "It felt so great. I had a great week of practice and was doing the things I needed to do." Temple's chance to put the game away was foiled when Navy's Jarid Ryan intercepted a pass in the end zone intended for Branden Mack on a second-and-goal from the 9-yard-line with 2:06 left. The Owls then clinched the win after Navy threw four incomplete passes on the next series. Armstead missed the game due to an undisclosed injury (believed to be an ankle) suffered in last week's 49-6 win over East Carolina University. Rob "Nitro" Ritrovato started in his place. Jager Gardner and Tyliek Rayno also lined up at running back. Leading, 10-7, at halftime, Navy scored on the first drive of the third quarter, with Nelson Smith (18 carries, 108 yards) capping a four-play 75-yard drive with a 12-yard touchdown run up the middle, breaking several tackles. Will Mobley's 31-yard field goal on the next series cut Navy's lead to 17-10. The Owls tied the score at 17 on Ritrovato's 1-yard run on fourth down with 5:53 left in the third quarter. The key play in the drive was a 40-yard completion to Bryant, down to the Navy 8-yard line. On the next series, Navy had an apparent 30-yard touchdown run by slot back Malcolm Perry nullified by a block-in-the-back penalty by Ford Higgins who committed the penalty on defensive tackle Freddie Booth-Lloyd, who was hustling down field. The play was supposed to be an option pass, but Perry, who had been Navy's quarterback this season until this game, found nobody open and sped toward the end zone. On Temple's first drive, the Owls had a first-and-goal from inside the 1-yard line and came away with no points. The Owls were forced to attempt a 26-yard field goal, but Mobley's kick went wide left with 11:16 left in the first quarter. Temple’s Kimere Brown returns the opening kickoff Saturday against Navy. On Navy's second play from scrimmage, Temple safety Delvon Randall forced a fumble that was recovered by linebacker Chapelle Russell on the Mids' 19-yard-line. Two plays later, receiver Isaiah Wright fumbled back to Navy. This time, the Mids took advantage, driving 71 yards in 17 plays, elapsing 10:01, but had to settle for a 24-yard field goal by Bennett Moehring on the first play of the second quarter. Temple took a 7-3 lead on the next series when Raynor, the Imhotep product, scored his first career touchdown on a 15-yard run up the middle on a draw play to give Temple a 7-3 lead with 11:31 left in the first half. Navy came back on its next possession to score on Lewis' 1-yard run and take a 10-7 lead with 5:45 left in the half. That capped an 11-play, 75-yard drive that took 5:46. Navy, with its always difficult triple option, rushed for 270 yards, but that was still below its average of 310.4 entering the game.